With apologies for the quality of these photographs, taken early in the new millennium, . . . but we are thus now able to see rare action shots of Stefani, Lakatos and Magosi, against Mssrs Swart, Meier, Devine, etc. 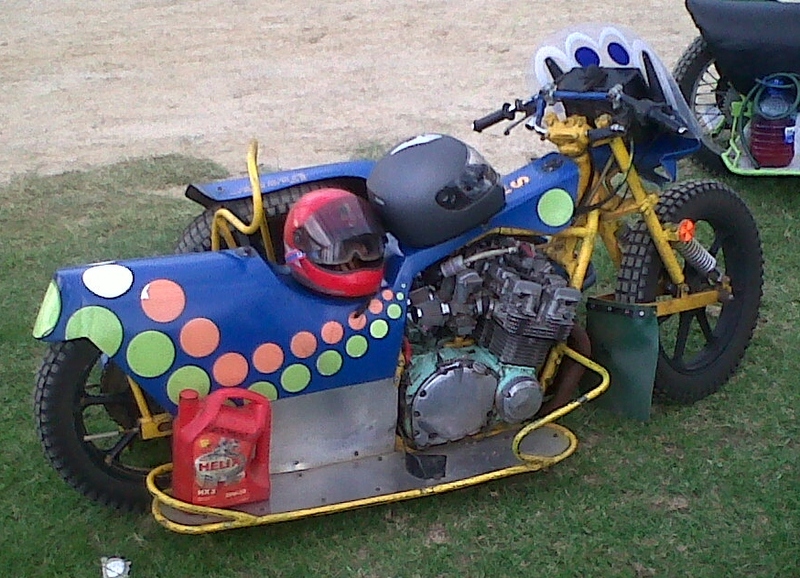 (as captions on each,) in the early days of Walkerville Raceway. 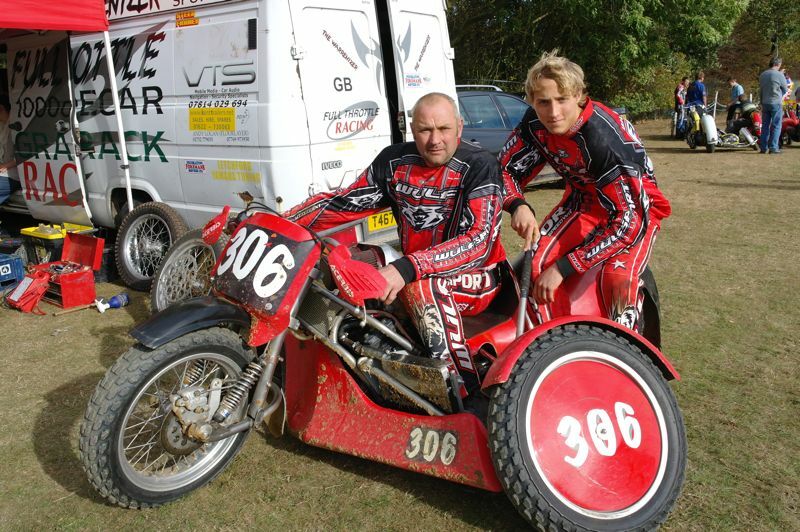 Seen below, Byron Bekker receives a special recognition award for 100 consecutive league appearances for his UK club, Scunthorpe Scorpions, at the Lincolnshire track in 2008. Brendan Coughlan is seen in action at Walkerville and, inset, with the S.A. national trophy. Bevan Compton spent time in the States around the turn of the millennium participating in the I.C.E. 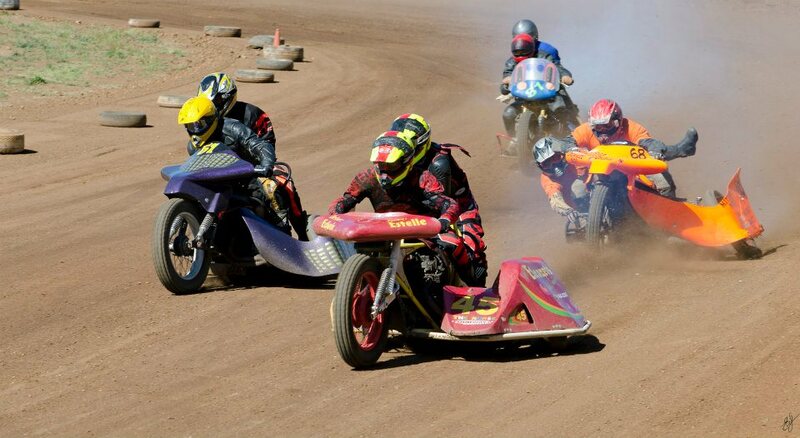 Series, (International Championship Events",) World Cup Series staged across the USA. More correctly termed 'speedway on ice' as distinct from European Ice racing, the machines were conventional speedway bikes with studs rather than spikes that thus allowed some sliding on the small tight ice skating rinks. Full details of the Series, staged between 1983 and 2005, can be found HERE under 'Document 3 - USA'. are seen at the MSA's annual award ceremony at Caesar's Palace, Boksburg receiving their 'Motorsports South Africa' trophies from Tom Claasen, President of its off-road motorcycling commission. 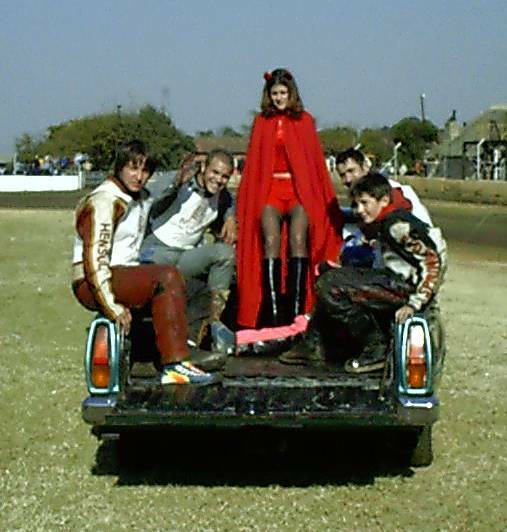 The MSA Gala Dinner was held in February 2002, subsequent to the riders' successes in the 4-round events, raced at Walkerville, Nelspruit, Lichtenburg and Klerksdorp during the 2001 season. in action at Walkerville in 2002. WALKERVILLE Eugene Smith, Martin Bekker, Deon Swart, Byron Bekker, Jonno van Wyk, Neil Thompson. South Africa on the World Championship stage, 2003. Further to the piece on Karl Lecky's involvement in international World Championship events in 1997 & '98, (Gallery p2,) below are 2 shots of Warren Meier taken at Heusden-Zolder, Belgium when he took part in the WC Quarter-Final there in 2003. Below is the obituary that appeared in 'The Citizen' on the death at 89 in 2005 of Buddy Fuller, the great motorsport promoter and one-time Springbok speedway champion and national captain. Shown also is a poster specially produced in his honour by the many appreciative riders & drivers that rode for him, - several seen below at the gathering for the service - , and an image of the old Wembley Stadium where so many of the events that he organised, dirt-track and tarmac, 2-, 3- and 4-wheeled, were staged. Boet Strydom, Henry Long, Arthur Bruins; knlg Denzil Kent. Taking the prizes in the 2007 and 2008 seasons, - Boet Strijdom presenting. 15-yearold Wayne Coughlan on a Jap in his first season of 1976, up against Vic Pretorius at Daggafontein, Springs. Later, Jawa-mounted for Durban Hornets. Father and son: present-day Wayne and Brendan Coughlan in 2015, performing together on guitar. Zeeman, - Past & present. Brad Zeeman is the grandson of Laurie Zeeman who rode speedway for Johannesburg Tigers in 1947 but had greater success and fame in the '50s as a Road racer in the 350 Class, first with a Velocette and then an AJS. He is seen below in a rare colour photo of that time at Old Barn Speedway, Alberton, on his stripped down Triumph 500cc Tiger where he rode with Buddy Fuller, Henry Long, Fred Wills and others. 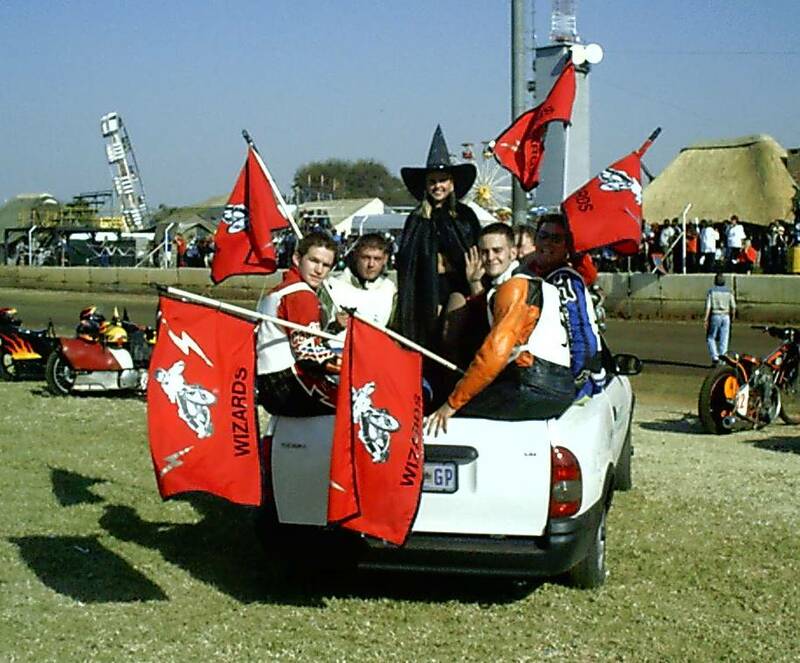 Brad, who took 3rd place in the 2001 U21 SA Championship is seen at Walkerville around 2008, when he last raced. This appendix and accompanying slideshow on Laurie Zeeman covers the various phases of his racing career, with many photographs from the '40s, '50s and '60s. 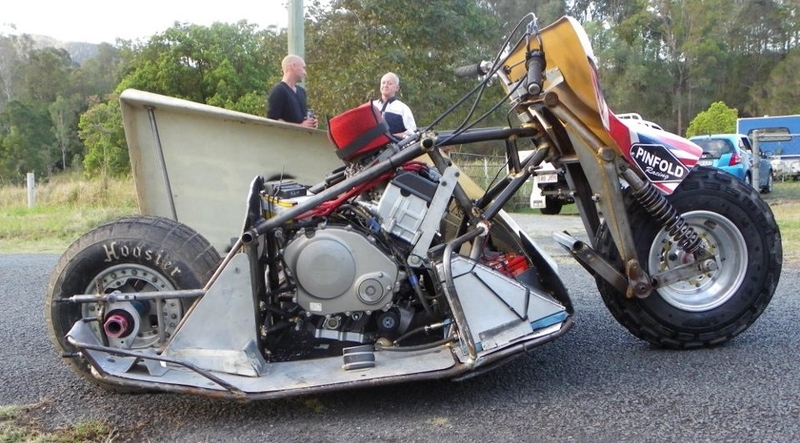 At Walkerville everyone is familiar with the big boys' 1000cc combinations but probably less so with the alternative class of 500cc chariots that can be seen on the same programme in Europe. 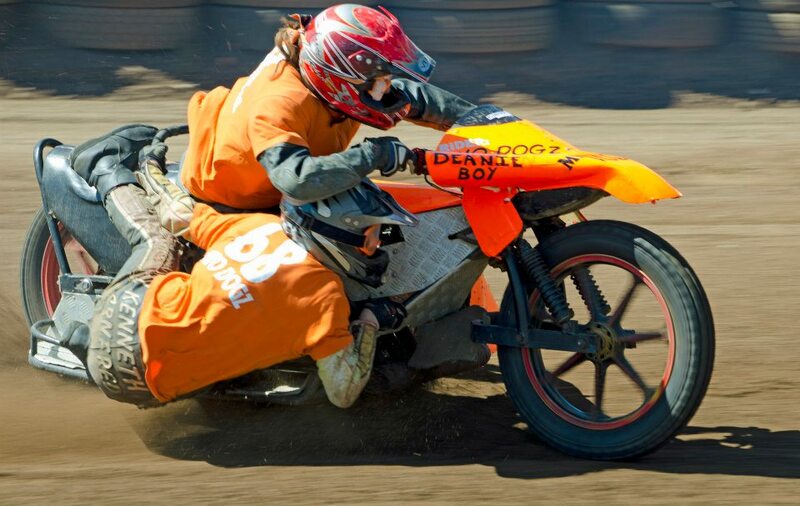 On continental Long Tracks, - sandbahn and grasbahn - , and at UK Grass Track meetings (plus occasional speedways,) it's not uncommon to feature races for both 500cc and 1000cc classes on the same bill. frt: Bobby Bulmer, DJ Devine, Chad Durieaux, Bobby Devine, Deon Prinsloo, Mike Russell. Glasgow Tigers v. Scunthorpe Scorpions, Premier Lge (= Div.II) 2008, - Bekker. in Yllw helmet, gate 1.